Discover the difference between vacuum types and the features they offer. 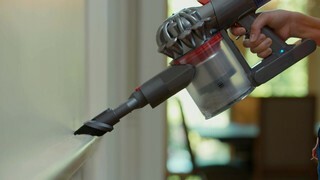 A vacuum as an essential cleaning tool for any home. Find one that has the features you need to get the job done right. Don't worry, you got this. There's more choice than ever these days when it comes to different vacuum types. Handheld and stick vacuums are compact and light weight. They are made to clean small messes quickly and easily. Stick vacuums work well for those in between cleans and can be used on various flooring. Some models feature a motorized-cleaner head which will clean carpets more effectively. Two-in-one cordless stick vacuums provide the ultimate convenience of owning both a stick vacuum and removable hand vacuum. Allowing you to easily clean your stairs, sofa, or car. Robotic vacuum cleaners are prized for their convenience. With just a press of a button, these self-propelled vacuums will clean the entire floor before returning to its home base to recharge. These models are ideal for smaller spaces, such as apartments or condos. And they serve as a great secondary vacuum for larger places. Robotic vacuums are designed to clean two to four rooms in a single charge, depending on the model. Upright vacuums work well on both carpets and hard floors. They have excellent power and can handle high volumes of dirt and debris before they need to be emptied. Most uprights are bagless so there's no need to purchase replacement bags. They're also available in compact models, which are ideal for small spaces. Canister vacuums allow you to pull the machine along behind you cleaning both carpets and hard floors. You can choose between bagged and bagless technology and various cleaner-head types. There are three types of canister-cleaner heads-- passive, air driven, and motorized. Canisters with a passive-cleaner head are very lightweight and portable but do not have a motorized brush roll to deep clean carpet. They are ideal for hard floors. Air driven-- also called turbine-head canisters-- drive a more powerful pickup versus passive. Motorized cleaner heads are the most powerful and are best for deep cleaning carpets. Most motorized canisters can switch from cleaning carpet to hardwood floors with just a switch of a button turning off the brush bar. Vacuums are available with several convenient features. Cordless vacuums are becoming more popular for their versatility and convenience. For longer run times, look for cordless models that use lithium battery technology. These batteries are more efficient, provide fade-free power, and are better for the environment. Bagless vacuums give you the money-saving feature of not having to buy replacement-vacuum bags. Allowing you to simply clean out the canister when it's full. Above-floor cleaning tools are attachments that come with your vacuum that allow you to clean items like drapes, baseboards, and upholstery. If these tools are important to you, make sure the hose on the vacuum has sufficient reach for what you need to accomplish. If you have pets at home you may want to choose a vacuum that comes with specialty pet attachments for cleaning pet hair and messes more efficiently. If you or someone in your family suffer from allergies or asthma, you'll want to choose a technology with a filtration system to create the best air quality possible. Cyclonic technology, found in bagless vacuums, uses centrifugal force to separate the dirt from the air. Replacing the need for a filter in the cup. The more stages a cyclonic system has, the more dirt it is able to separate from the air. Bags filter air the same way they trap dirt and dust, relying on how tightly the material is woven and the density of the paper. Standard bags have a filtration level of 85%. HEPA filters are ideal for managing allergy symptoms. Choose a vacuum that's easy for you to use and has all the features you need. Don't worry, you got this.